There is so much to do in Chatham! Why do most people come to Chatham for vacation or to live? The Beaches! With miles of pristine white sand, a day at the beach, swimming, stretching with yoga or even surf casting is better than a day in the office. Just look at our Summer Weather forecast. Beach Shuttle/Water Taxi service is available also. 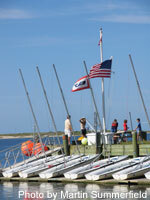 Whether you are an avid Avid Sportfisherman or Boater, Chatham is your home port to the ocean. If you love water sports, for example - kayaking and paddle boarding - we have places where you can rent or purchase equipment. You can view the playful seals by booking a cruise on one of our Seal Tours or watch them follow the fishing fleet into the Chatham Fish Pier from the overlook as the fishing boats come in with their daily catch. Chatham is blessed with beautiful scenery, as evidenced by our Conservation and Preservation areas, and our many Nature Trails and Parks. Tours are available for Wildlife/Birding enthusiasts. The Scenic Landmarks are abundant and well worth a casual stroll on a sunny afternoon. If you love music, the summer Band Concerts are a wonderful addition to the sounds of Chatham. If Baseball is your sport, then have we got excitement for you! Veterans Field in Chatham is the home park of the Chatham Anglers (Chatham A's), one of 10 teams in the widely known Cape Cod Baseball League. If you are into Biking, then Chatham has the most beautiful paths, roads and off the beaten path areas to ride by and see. If you would like to find activities for your teens and pre-teens, please check out our Youth Activities in Chatham. Also check Summer Science Classes in July and August at the Chatham Marconi Maritime Center. Is Golf your other passion? Chatham has by far the most beautiful golf courses overlooking the Atlantic. Challenging, yes - but so worth it. Are you the Museums and Historic Places type? Chatham boasts some of the best preserved historic homes and buildings, culminating in Chatham winning the 2007 Distinctive Destinations Award by the National Trust for Historic Preservation which we are very proud of!